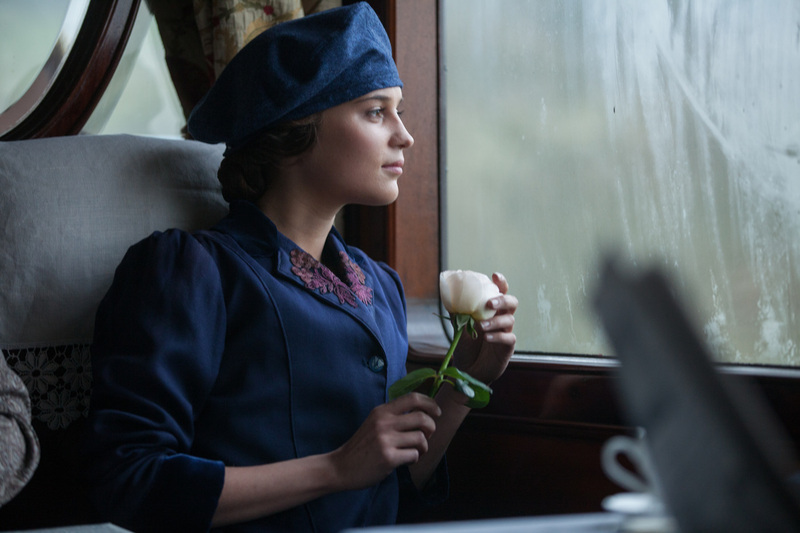 This article is a review of TESTAMENT OF YOUTH. Yearning and tragedy. Old fashioned in a dated way, rather than timeless. Not troubled by profound thinking, TESTAMENT OF YOUTH is a leaden affair. First World War set, the message of pacifism is drowned out in a sea of forced longing. For a vastly superior Great War romance, look to Jean-Pierre Jeunet's A VERY LONG ENGAGEMENT. And for the conveyance of a generation wiped out, see SAVING PRIVATE RYAN. TESTAMENT OF YOUTH falls between several stools, not being romantic enough, devastating enough and political enough. Moments of emotional depth occur on occasion, but the majority of the runtime has the air of Sunday afternoon telly. Armistice Day, November 1918, signalling the end of the First World War, Vera (Vikander) pushes stoically through the cheering crowds. Entering a building, she spies a painting and daydreams herself drowning. Such a flight of imagination is a motif abandoned by a doddery film. Cutting to four years earlier, and smiles contrast the dour. Initially headstrong it seems, but coming across as stroppy, Vera decries the idea of marriage just as Roland (Harrington) walks into their country home. Defences and opinions come down quickly, and mutually smitten eyes are blinked on. Edward (Taron Egerton), her brother, and friend of Roland, is pestered when her love does not write from boarding school. Yawn. Mention of the suffragette movement is just that. Feminist analysis, like so much of TESTAMENT OF YOUTH, is cursory. Gears shift slightly as siblings help one another. Edward convinces their father to pay for her once Vera’s university place is secured, and the latter argues for Edward being allowed to volunteer for the army – a decision that will come to haunt both sibling and parent. Edward, Roland their other pal, Victor Richardson (Colin Morgan), go off to fight, while Vera begins higher education. Clumsy narrative drive comes in the form of blaring newspaper headlines. Bar a wide shot of bodies outside a makeshift hospital, there are no stand out visuals or actual combat sequences – the latter to not glorify, or due to budgetary constraints? Boyfriend and brother in harm’s way means Vera puts studies on hiatus to become a nurse. Staid interactions of hand-wringing now dominate. In one scene, however, West brings his A game by breaking down at a train station; sundering post-Edwardian British stiff upper lip reserve. Come the coda in a movie that seems to be forever ending, Vera commences her role as a pacifist campaigner in a clunky debate society meeting. In my notes, while watching, I wrote that TESTAMENT OF YOUTH is for the mildew-minded, which maybe too harsh. Or not.